This episode continues in the vein of dealing with things that frighten us, albeit in a different context. Pablo the Soccer Monster is not seen as “scary,” but lonely and in need of Uniqua’s friendship – a sort of Beauty and the Beast takeoff. Some Backyardigans episodes are rather heavy-handed in terms of showcasing a particular social lesson, like “Pirate Treasure” or the upcoming “Key to the Nile.” Others are simply silly, written to enhance the characters and their relationship with the audience. 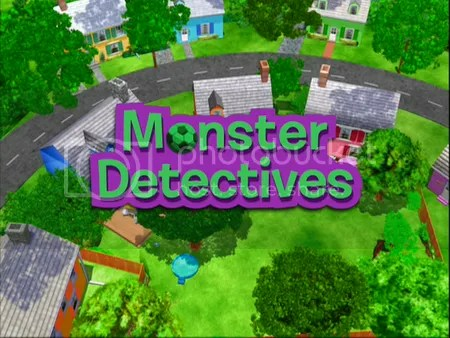 “Monster Detectives” falls more into the latter category – mostly because shouting, “SOCCER!” in a growly voice is way more fun than it should be – but it also subtly tucks in commentary about a typical problem children often face. “Of course when you’re a kid, you can be friends with anybody. Remember when you were a little kid, what were the qualifications? If someone’s in front of my house now – that’s my friend, they’re my friend. That’s it. This observation is funny because of its simple truth, which is evident in “Monster Detectives.” Pablo loves soccer, so much so that (in the context of an imaginary game) he is single-mindedly “monstrous” about it. He plays soccer all the time, and wants everybody else to play it, too. Unfortunately, his enthusiasm is slightly off-putting to those who can’t understand his zest. Opposite him is Tyrone, a Monster Detective with a Joe Friday-seriousness about finding Uniqua’s missing soccer ball. Uniqua is the first to notice that Pablo isn’t bad or scary, but sad and lonely. She decides that her love of soccer is akin to his, and plays a game with him, turning her into a “soccer monster,” too. Tyrone clearly doesn’t have the same love for soccer as the others, and therein lies the true lesson: learning to be understanding and accepting of others’ interests. Uniqua made the important first step towards friendship, and Tyrone chose to follow suit in order to enjoy his friends’ company, regardless of his merely being a passing fan of soccer. His becoming a “soccer monster” at the end is an example of what often happens when we try new things: we learn to love them. The music by Evan Lurie, Doug Wieselamn, Adam Peltzman, and McPaul Smith is 1960’s Rock, complete with air guitar solos and a classic remix of “When the Saints Come Marching In.” There’s another variation of Hide-and-Seek (seeking for something while hiding from someone else seeking you! ), and, as mentioned above, it’s quite entertaining to run around the house screaming, “SOCCER!” – with your kids, of course. How do you and your child deal with meeting new people?